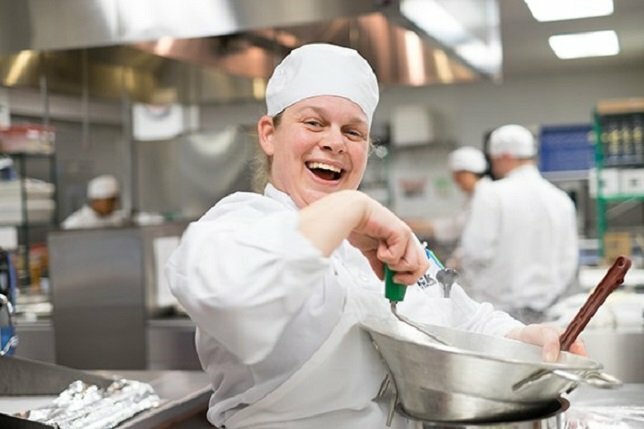 Bay Shore's Shannon Bloomquist won Suffolk County Community College’s Chopped-like culinary competition, Battle for the Beach, with a tasty pan seared chicken with natural au jus, braised endive and herb scented mash potatoes. Bay Shore's Shannon Bloomquist won SCCC's Battle for the Beach competition. Riverhead, NY - December 14, 2015 - Bay Shore's Shannon Bloomquist won Suffolk County Community College’s Chopped-like culinary competition, Battle for the Beach, with a tasty pan seared chicken with natural au jus, braised endive and herb scented mash potatoes. The competition was held last Friday at the college's Culinary Arts and Hospitality Center in Riverhead. Student contestants were presented with a mystery basket of ingredients – a whole chicken, broccoli, endives, red pepper, potato and shallot -- that they had turn into a mouth-watering dish in just 90 minutes. The competition is similar to the popular reality television show “Chopped” airing on the Food Network. Top Chef Bloomquist won a seven-night stay at the Sheraton Clearwater Beach Resort in Clearwater, Fla., and an opportunity to work under the supervision of the resort’s executive chef. The prize includes round-trip airfare and ground transportation. Subject: LongIsland.com - Your Name sent you Article details of "Bay Shore's Shannon Bloomquist is Suffolk's "Top Chef""